Do not select the timer, select light crust. Push start because this is a whole grain bread. Let the machine do it's magic & go about your business. When bread is cooked (and cooled), remove from machine & cut into slices. If using machine to knead: Select Dough only. After beep sounds, remove dough. Place in 9x3 bread pan, cover & leave pan in a warm place for 1 1/2-2 hours, to allow rising. An unheated oven is the perfect spot. Set the pan over a smaller bowl/pan of hot water to quicken the rising process. Once it has doubled in size, sprinkle top of bread with extra cheese and onion flakes. Bake in oven at 350 degrees for about 30-35 minutes until top is a light golden brown. 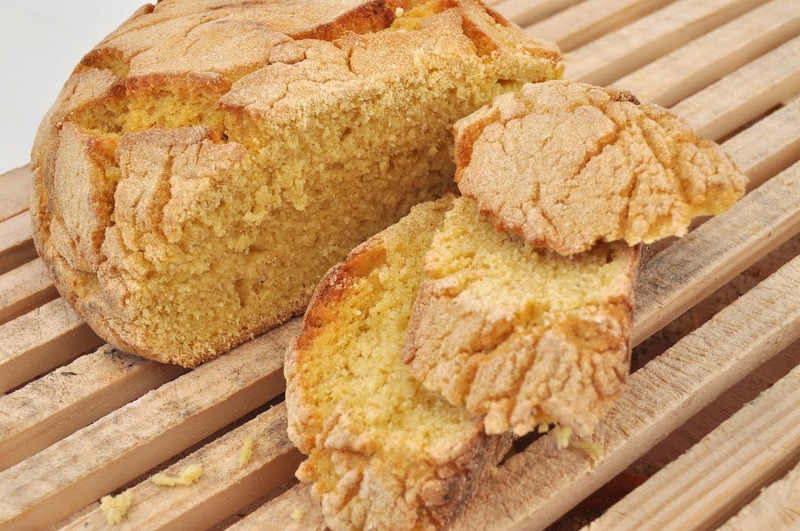 This bread is similar to French Bread in texture, crispy on the outside and soft on the inside, but the corn flour (or cornmeal) gives it it's delicious flavor. Do not select the timer, select light or medium depending on how you like your crust. In a large bowl, combine dry ingredients first, then blend in wet ingredients & blend evenly. Place dough on a lightly floured board (avoid over flouring the pastry board). Knead by pressing down on it with the lower palm (or heel) of your hand. Lift the mass off the board & throw it back on the board. Repeat for 5 minutes or until dough is smooth & elastic. Place dough in a greased 9-inch round pan, 2-3' deep, cover & leave pan in a warm place for 1 1/2-2 hours, to allow rising. An unheated oven is the perfect spot. Set the pan over a smaller bowl/pan of hot water to quicken the rising process. Once the dough has doubled in size, punch it down in it's bowl, remove & knead it again a few times. Shape the dough into a ball, place in baking pan, and allow it to rise again until doubled in size, about 1 to 1 1/2 hours. Bake in a preheated oven at 350 degrees until top is golden brown, about 45-50 minutes. Allowing it to rise twice yields a lighter texture. 1/4 tsp each spice: oregano, basil, garlic, onion, dill, thyme & parsley. Select Dough only. After beep sounds, remove dough. Divide & form dough into balls. put balls on lightly greased baking sheet, cover & leave pan in a warm place for 30 minutes to allow rising. Form balls into tear drop shapes & roll until 1/8" thick. Roll up strip starting from wide end to narrow. return rolls to pan & cover. Leave in a warm place for 50 minutes to allow rising. Brush rolls gently with a mixture of water & beaten egg yolk to form a glaze. bake in oven at 370 degrees for 15-20 minutes) until they become golden brown. Serve warm. Push start because this is a variety bread. If doing by hand, for the oven, the same order applies, Mix dry ingredients first then add fruits & wet ingredients. Do not select the timer, just push start because this is a variety bread. Let the machine do it's magic & go about your business. When bread is cooked (and cooled), remove from machine & cut into slices. This is an Old Fashioned Oven Bake Bread. Measure & sift together the first 6 ingredients into a bowl (if orange rind is powdered, otherwise mix the first 5 ingredients). Combine remaining ingredients & stir into dry mixture. Pour into a greased 9x5 loaf pan. Bake in oven at 350 degrees for 50 minutes. To cook it in a bread machine;)Add 2 tsp yeast. Do not select the timer, just push start because this is a variety bread. Let the machine do it's magic & go about your business. When bread is cooked (and cooled), remove from machine & cut into slices.